How Much Compensation Can I Claim For A Slip Trip Or Fall Accident at Work? When it comes to accidents, many of the most unforeseen yet common are those which happen at work. These can often occur due to oversight or negligence, perhaps a caution sign not being placed near a wet spot or products and equipment not being stored properly. These potential safety hazards are not uncommon in the workplace. When things go wrong, you might be wondering whether you could make a claim for slipping on a wet floor, or find yourself thinking, ‘I slipped and fell at work what should I do?’ If this sounds familiar, then help is at hand. Unfortunately, such accidents occur regularly all over the UK. Many of these accidents can be classified as discrete occurrences which happen in the workplace, often resulting in a slip, trip, or fall. Many work environments are much more hazardous than one might expect and it’s not just construction sites or faulty electrics that can potentially cause a dangerous and unforeseen accident for an employee. Indeed, accidental injury cases are all too common, plenty of them taking place in seemingly innocuous and mundane settings. As is the case with any injury, the amount of damage or harm suffered depends on a myriad of factors. It’s important to treat every situation differently. While one victim may only feel a slight twinge in their ankle, easily remedied with a bag of ice, an unluckier person might suffer a horrific injury to their back, hip, arm, or another part of their body. These factors can contribute to how much compensation for a fall you can expect to receive. But this type of accident can also be psychologically harmful, as work is often regarded as a safe space. Suffering an injury in the workplace can leave a lasting impact beyond the obvious, changing the way you view your surroundings. It’s easy to ignore how much compensation for a fall you might receive after suffering from an accident at work. It’s entirely understandable. You might be worried about being treated unfairly or even ostracised at work, simply for filing a claim for slipping on wet floor against the company. But this should not prevent you from seeking what is rightfully owed to you in the wake of an accident. As consummate legal professionals, we will provide the best possible advice in these cases, as well as helping you discover how much compensation for a fall you could receive. We are here to lend guidance and support every step of the way. A guide to fall at work compensation claims. What can I claim for after a fall, slip, or trip at work? No Win No Fee fall, slip, and trip at work compensation claims. For what reason can I claim compensation if I have had a fall or slip trip accident at work? What causes a fall or slip trip accident at work? What to do if you have a slip trip accident or fall at work you think you can claim for. How to make a personal injury claim for a fall or slip trip accident at work. Personal injury claim amounts for a fall or slip trip accident at work. Why choose us as your fall at work compensation claim service? The dedicated service we offer for trip or fall compensation starts with a free consultation. This means that you never pay anything up front. It’s important that we understand your claim and how much we can do to help, so our initial consultation costs nothing. After you contact us, we will set up a fact-finding session with one of our legal advisers. There is no obligation to continue with your claim after this session if you do not wish to do so. The initial meeting serves the purpose of gathering all the necessary information on your case. All of the pertinent details regarding the accident, the environment it took place in, the severity of your injuries, and so on. During this first meeting, we will evaluate whether you have a valid claim, and to give you an estimation of what type of damages you could be awarded, and how much. We do understand that this is a particularly challenging time for you and the uncertainty of the process can be daunting. Therefore, we are here to lend support and answer any questions you may have. We want to provide a structured, professional atmosphere that makes you feel protected and supported. Once we have gathered the necessary information, we provide you with detailed steps and suggestions on how to proceed. For those who qualify, this often includes information on average compensation for slip and fall cases, as well as details on how we can represent such cases on an affordable, conditional fee basis. This means that payment is only due in the event we successful make a claim against your employer or company for any damages or medical bills incurred. We call this our ‘No Win No Fee’ promise. It’s important to have context, to understand that how much you may receive, and to know how long the claims process will take, all of which depends on a range of factors. Every single claim can be incredibly varied and unique. However, we can provide a guide to how similar cases have played out. For instance, our fall compensation calculator can give you a more concrete understanding of what to expect. Employers are heavily regulated to ensure that they always keep the welfare of their employees at the forefront of operations. The Health and Safety at Work Act 1974 outlines the basic requirements for employee safety. This legislation has been modified over the years, and extended by new legislation such as the Management of Health and Safety at Work Regulations 1999, and the Workplace (Health, Safety and Welfare) Regulations 1992. Furthermore, certain industries have their own set of legislations, such as building firms who employ people to work on scaffolding or other raised platforms. They are regulated by the Work at Height Regulations 2005. General damages – any damage to yourself or your personal belongings during the fall. If you broke your glasses or a piece of family jewellery, it’s possible that this is covered. Care claim – if your injury forced you to remain at home and to rely on in-home care, we can attempt to recover these costs. Loss of earnings – the amount of earnings you lost while your injury prevented you from working. Travel Expenses – any expenses incurred in the aftermath of your injury, which could include travelling to out of town physicians, taxi fares, etc. Medical Expenses – any expenses charged by a doctor, hospital, physical therapist, pharmacist, and so on. Medical insurance doesn’t always cover you as thoroughly as you might like and many out-of-pocket costs quickly add up. When it comes to making a claim for an accident at work law changes frequently, so although we consider the above information correct in most cases, you will need to contact us so we can evaluate your specific case to get a truly accurate idea of what you might be able to claim for. 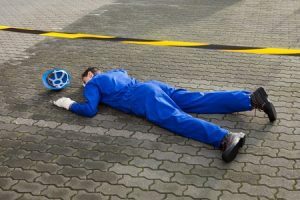 Going through the necessary steps to properly file a compensation claim for a slip or trip injury can seem arduous and taxing. Depending on who you reach out to for help, it can also be incredibly expensive. These ongoing legal fees can put a real dent in your pocket, especially if they begin right at the start of the process and continue throughout your claim. For those who aren’t currently working because of their injuries, this can be just as disheartening as the accident itself. Realistically managing these legal fees can seem impossible. If you are already struggling to put food on the table and pay your bills on time, another added monetary hurdle is the last thing you need. Additionally, many people do not have the funds available to take care of a lawyer’s up front fees. No one should have to experience this. It’s why we’ve come up with a way to help you get the representation you need and get you back on your feet as soon as possible. We offer something called the ‘No Win No Fee’ agreement. Simply put, this means that you don’t pay a single penny in legal fees during the claims process. If we don’t win your claim, you don’t pay us a thing. Until the claim compensation has been paid out, you won’t be charged. When you do win, we’ll deduct our fee from the total compensation awarded. With average compensation for slip and fall, you receive the money you need to help you cope with the recovery from your accident. Another name for this type of deal is the Conditional Fee Agreement, or the CFA. This particular concept was introduced into specific legal and business transactions to ensure that those who lack the finances or the ability to pay professionals would still be able to hire the legal guidance and advice necessary to win cases such as pavement trip compensation. You also don’t have to worry about us taking a huge chunk of your compensation. Legally, we can take no more than 25% of the total compensation payout that you receive as our fee. This means you will receive at least 75% of the compensation regardless. Our clients love this protection, as you don’t pay anything until the trip and fall compensation has been issued. It’s stress free and simple. Negligence – the company hasn’t done their due diligence in making sure that products and machinery are returned and stored in the proper manner, away from foot traffic and potential collisions. Health and safety – hazards such as oil spills, wet flooring, badly maintained floor surfaces and inappropriately placed obstacles. Lack of on-site medical care – having a first aid kit is the bare minimum of what is expected. Having one with an extensive array of items is even better. Caused by another employee – this may happen when another person is simply not acting conscientiously with regards to the usage of specific equipment and any potential dangers involved. This could be someone absent-mindedly blocking doorways, cluttering hallways, or being generally careless and unsafe. Lack of staff training – knowing how to properly maintain levels of safety in specific work environments is essential and training employees helps to remind people of how to provide a safe work environment for all. Equipment or tools being left out, causing footpaths to be blocked. Partially completed objects or potentially harmful materials being left out, causing obstruction. A spillage of any liquid or product on the floor (even the smallest amount). Faulty, defective floorboards or uneven walking spaces. Faulty, ill-fitting tiles or slabs. Even then, these are only some of the causes of the trips and falls we encounter every day. Being constantly aware of your surroundings doesn’t necessarily save you from an accident if your environment isn’t kept safe and appropriate at all times. If you’re interested, our slip and fall compensation calculator can help you discover how much you can potentially receive in compensation for a fall at work. It’s important to understand that your actions immediately after the accident are crucial to your claim. This means that the moments prior to, during, and directly after the incident should be seared into your memory for later use. Once you’ve reached a position of safety, write as much down as you possibly can. Even the smallest detail can be vital. Get statements from people who witnessed what happened. Take pictures or – if you are having trouble getting around – have someone nearby take pictures of the scene, as well as any potential culprit. Choosing to make a claim is never an easy step to take. Even if you have endured a comparatively small amount of pain, you should still consider filing a claim. This can help prevent future incidents which might be even worse. Furthermore, there can be considerable mental anguish experienced after even a minor accident. This is why we feel so strongly about streamlining the process of filing a claim. The first thing you should do is to reach out to someone you can trust for sound legal advice. This is our speciality. The completely free consultation we offer is put in place so that you can immediately relieve your anxiety and get rid of your mounting stress. You can relax in the knowledge that we will be giving you the very best advice regarding how to properly handle your claim moving forward. How did this fall (or accident) occur? Where were you when you fell? Did you act in any specific way that would have potentially caused the fall? Did you suffer any injuries in the direct aftermath of this fall? Have you had to take time off work as a result of this fall (or accident)? Once these answers have been gathered, we will have a clearer picture of the next steps that should be taken. After we have provided you with the free advice, we will then potentially offer you representation for your claim. Part of this includes the ‘No Win No Fee’ agreement which ensures you won’t be out of pocket. Although it is sometimes hard to estimate the exact amount of compensation you can receive from a slip or trip claim, we’ve put together a table which shows the standard amounts that have been paid in the past. The below figures do not include estimates for a loss of earnings; those type of numbers will be calculated on a case-by-case basis. Therefore, our accident at work compensation calculator can act as a good barometer for your potential case. Brain damage (moderately severe) £166,500 to £214,350 As well as brain damage causing partial paralysis. Neck injury (moderate) £6,000 to £29,250 Contingent upon actual neck damage suffered and loss of motor movement and ongoing pain. Neck injury (severe) £34,575 to £112,750 Contingent upon severity of break, and ongoing pain or permanent adverse effects. Back injury (moderate) £4,500 to £21.100 Contingent on ongoing pain, severity of initial damage. Back injury (severe) £29,475 to £122,350 Contingent on ongoing pain, severity of initial damage and long-term adverse effects. These are the injuries most commonly suffered by people who have a fall at work. Injuries to other areas of the body, or serious injuries such as forms of paralysis, are judged on a completely individual basis and, as such, generic estimations are almost impossible. Any type of ongoing long-term injuries (such as severe back injuries) are much more complicated when they occur, as they must be factored into the compensation claim from the beginning, as does any loss of income or other damages. Why Choose Us as Your Claim Service? We want to help those who suffer from sudden and completely unforeseen accidents. It is our sincere belief that, regardless of ability to pay, everyone should be provided with the help and the means to properly enact a claim for losses and damages. Our commitment to helping the victim and to meeting our clients’ needs is deeply rooted in wanting and striving to do the right thing. Your satisfaction is of paramount importance to us and influences everything we do. When you reach out to us for assistance in dealing with the aftermath of a nasty fall at work, we will do everything within our power to see your situation through to a positive resolution. We will not shortcut or shortchange you; we take our jobs and the legal advice we provide very seriously. We understand that every situation is different, which means each situation is affected by a myriad of factors. This is why we strive for the happiness and comfort of each individual, while also working to win the greatest possible compensation from any given claim. Although you could use an on-line compensation for work accident calculator, we think we offer a better way to discover whether you have a valid compensation claim for a work related injury. If you have been the victim of a horrible and unexpected accident at work, contact us immediately to set up your consultation, completely free of charge. There is no reason you should be facing such a confusing, worrying situation alone. If you are scared and unsure of what to do, we will be able to provide you with the necessary information to make an informed legal decision. Even if you are not certain that a third party is at fault, remaining as informed as possible about your options is essential. Contact us now so that we can evaluate your case and help you understand which additional steps can be taken. How Much Compensation for A Slip Trip or Fall Claim?